I have always been a huge fan of user knives. Blades like the Benchmade 710, Spyderco Gayle Bradley, and Cold Steel American Lawman have always resonated with me as great knives because they are great tools. As a collector I am still enthused by the latest and greatest in materials and technology, but I will always have a soft spot for unpretentious tool knives that work really well. These users are what spend the most time in my pocket, while the fancier blades spend the most time on the shelf. Enter the Kershaw Knockout. Here we have a bold drop-point blade married to a simple handle. The knife has visual presence, but it still appears utilitarian, has an interesting sub-frame lock mechanism that combines the strength of a frame lock with the weight of a liner lock, is made in the USA, and retails for around $55-65 depending on where you buy it. I am especially drawn to this price because the $50-100 price point is notoriously tough for the retail knife industry. It seems that there are a lot of new releases where the knife retails for less than $40 or more than $100, but relatively few knives are coming out in the $40-100 range these days. Looking at pictures, specifications, and the bottom line, Kershaw potentially has a really nice user knife here, and for that reason I am excited to finally acquire one for my personal collection and share some thoughts on it with you. The Knockout has an overall length of 7.875″, has a 3.5″ blade, and weighs 3.8 ounces. This is a good size knife, but it’s surprisingly thin and lightweight. It’s not totally unreasonable to consider this as a daily carry, and it certainly makes for a great utility knife for weekend projects, or for folks who can get away with carrying a bigger knife on a daily basis. The blade shape is a classic drop point that has been punched up with some well placed lines. I really like how broad this blade is relative to the handle. It has great presence and is innately appealing. It is also very practical. The belly is deep and the high flat grind peters out to a thin yet serviceable edge. The knife cuts really well. The thin grind coupled with the broad profile makes for an excellent slicer. This knife is ideal for breaking down boxes and other slicing tasks. I cut through rope, and performed some food prep with no issues. This isn’t my ideal choice for a carving knife, and the thin blade doesn’t lend itself to hard use, but this is a great practical blade that cuts very well. There is a swedge but the tip is reinforced and comes to a fine point; excellent for piercing. The end result is the Knockout cuts well in a variety of scenarios. It’s not going to be the toughest blade, but if you respect it, the Knockout will get a lot of work done. Blade steel is Sandvik 14C28N, a Scandinavian stainless steel that has made a number of appearances in USA made Kershaw knives. I’m a fan of 14C28N, especially when given a lightly tumbled finish like on the Knockout. This is a proven steel for me. It holds a decent edge and is easy to maintain, and the blade geometry of the Knockout makes great use of this fine-grained steel. I have found that 14C28N will stain if you aren’t careful with it (and was difficult to clean up for the photographs), but that will hold true for a lot stainless steels. I think 14C28N is a great choice for a value oriented EDC knife. The Knockout has a black hardcoated aluminum handle with partial plastic backspacer. The black anodization on the handle slabs is reasonably durable, but will show signs of wear with use. Handle construction is simple and sturdy with two body screws threading all the way through the backspacer and handle. Everything lines up very nicely and has been well finished. The show side of the handle features a few arcs carved into the face of the aluminum for a little visual interest and traction. This is a sturdy handle and I find little to complaint about it. The ergonomics of the Knockout are adequate. Being a thinner handle, this doesn’t jump out at me as outstandingly comfortable, but it certainly works and it doesn’t have any glaring hot spots. The anodized aluminum provides a little traction and isn’t slippery. There is no jimping anywhere on the knife. I don’t mind this but I recognize that this is a personal preference. People looking for a more hard use knife might want to go with something a little thicker and with more traction. The Knockout was fine for my pedestrian purposes, but the thinness of the handle, while great from a weight and carry perspective, could turn off those who are looking to run this knife hard on a regular basis. The pocket clip on the Knockout is the same one found on the Cryo. It’s a blackened deep carry fold-over clip that has been mounted high on the handle and drilled and tapped for 4 corner carry. I like this pocket clip design and have zero complaints regarding the clip, carry options, or way this knife holds in the pocket. My favorite aspect of the Knockout’s handle is how thin it is. I have really come to appreciate this, especially in a larger knife. It carries very well. The Knockout is an assisted opening knife with the option of a flipper or ambidextrous thumb studs. I am not always crazy about assisted opening flippers, but on the Knockout it works and I actually like it. The blade responds quickly to a push of the flipper or brush of the thumb studs. These are true thumb studs, not blade stops on some other flipper folders (like the 0560 for example) so they are easy to get at and work flawlessly. The knife kicks open easily and locks in place with an authoritative “thwack”. The Knockout makes use of a sub-frame lock to lock the blade open, and is the namesake for this knife. 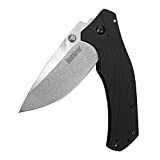 You probably already know this from doing other research on the knife, but the aluminum handle has been “knocked out” to accept a stainless steel lock bar, hence the name “Kershaw Knockout”. This is actually the first sub-framelock knife to grace the pages of BladeReviews, and is a really nice design. The hardened steel lock bar engages at around 50%, there is no blade play or lock stick, and the knife is still very lightweight for it’s size because the rest of the handle is aluminum and plastic. It’s a great practical design that has been well implemented. No complaints here. I will mention that my blade is fairly off center. It doesn’t rub, but is worth noting. The Knockout is a very solid offering from Kershaw. I have had my eye on this one since its release, and I am glad that I finally managed to get my hands on one. $55 gets you a well made American flipper folder with quality materials, a practical footprint, and an attractive design. For those wanting a larger knife capable of getting some real work done without breaking the bank, the Knockout strikes me as a good choice. There are definitely higher end and more exotic offerings, but the Knockout is a great no-nonsense tool and doesn’t have a whole lot of worthy competition at its price point. I will also say that I have tended to favor the USA made Kershaw’s over their Chinese made counter parts. The USA Kershaws are always really well done. The materials are a little nicer, the finishes seem better, and I have just had better luck with them for whatever reason. This isn’t intended to start some sort of flame war, but I’m just calling it as I see it. I’d rather spend $55 on a USA made Kershaw than $20 or $30 on a Chinese one. To me the Knockout is an example of Kershaw at its best. I recommend buying the Knockout at BladeHQ or Amazon. Please consider that purchasing anything through any of the links on this website helps support BladeReviews.com, and keeps the site going. As always, any and all support is greatly appreciated. Thank you very much. I have a soft spot for this Kershaw, so it is fun to see it reviewed here. I think it’s a very convenient urban EDC and the blade has a ton of slicing power. I love the edge taking/resharpening properties of 14C28N. One subtle downside: on the earlier production runs of the Knockout, *both* almuminum handles were finished with the attractive machined pattern that’s seen on the show side of this knife. Mine is from this vintage, and it looks nicer, and even gives a slightly better hand feel than the smooth surface they’ve adopted for the lock side on recent Knockouts (like Dan’s). Bit of a cost-saving measure by KAI, I bet. I think it was a misstep. I dislike it when they cheap down knives after they debut and become popular. Part of the reason someone would shell out almost 2x the money for a USA-made Kershaw is because of nice cosmetics and finishing. I like my older Knockout a bit better than the current ones. Thanks, Anon. It took me a while, but I got around to it. Interesting, I was not aware of that regarding the handle. I agree that it would have been nicer if they kept that detail. Thanks again for dropping by. Nice review. It looks like a great knife. I’m a fan of the sub-frame lock but not as keen on the scale pattern. Regardless you can’t go wrong at the price point for what you get! Thank you very much, Andrew. Kershaw could stand to hire you as an aesthetic consultant. I agree, the price is difficult to argue with. I have found myself with the Knockouts slightly less fancy lightweight brother the Piston lately. Aside from a few aesthetical notes (the thumb studs from the Blur are ugly/rubbish and they for some reason used all back hardwear apart from clip, one side of the pivot and the stop pin) I quite like the knife. Very light with a good blade and a handsome stonewash, chamfered inner edges on the G10, which is nice. Slim enough to reside in the back pocket of my Levi’s. I entertained the thought of the knockout, mainly for that lock, but decided against it due to weight and material choice. The Piston is now the knife I use in uniform and I’m sure the knockout would do a good job at it as well. Some would call it a “tactical” knife, those people are silly. Thanks for the thoughts, Lew. For whatever reason I wasn’t as drawn to the Piston, but given my time here with the Knockout I don’t doubt that it is a very fine blade. I’ll have to do some more reading on this one, but I liked this review. I agree with Edge Observer, the handle pattern is a little not to my liking. Hopefully they’ll release a different pattern at some point. I have to agree that I much prefer the USA made Kershaw knives over the ones made in China. The overall quality with USA made knives far exceeds just about anything made in China. I own the Knockout and it is one of my favorite Kershaw knives. I paid around $60 for mine and it is worth every penny. Thanks for your thoughts on the Knockout. Glad you are enjoying it. I agree – I much prefer Kershaw’s USA made products. I just came to your site and just want to say thank you Dan for the great reviews. Farzin, Thanks for taking the time out to leave some kind words. You are very welcome. It has been a pleasure to write about knives for several years now, and I am very glad to hear you have been enjoying the reviews. I’m looking for a good Kershaw knockout to buy my son for Christmas. He works in the oil field and is always using his knife. Which one do you recommend. He wants over 3″blade and I thought he said black blade but I could be mistaking. Can you help me out? Thank you Dan. How about this one? It has a black blade, green handle, and it’s priced right.